Twelve-week-old Duke was rescued from Melbourne’s west after being been cruelly thrown from a moving vehicle in mid December. Rescued by ambulance driver Noeline, the tiny Chihuahua Jack Russell Terrier Cross was brought to the Home for immediate care and veterinary treatment. Amazingly, the brave pooch only suffered bruising to his head. After Duke’s condition stabilised, he was fostered by Nik Kingsman and his partner who showered him with attention and love. In addition to being thrown from a car, little Duke had been burnt by his previous owners with cigarettes on the tender skin of his ears. 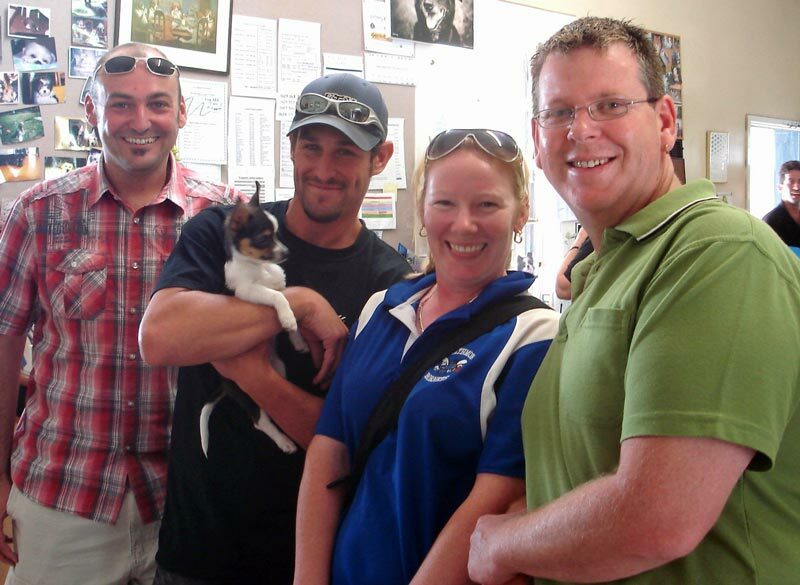 While Duke had no broken bones, Nik on the other hand suffered a broken heart when it was time to hand over the little fella to new parents Adrian and Natalie Rice. Thankfully though, the couple are friends of Nik, so not only does he know his little orphan is going to a good home, but he can pop in for regular visits. Duke is now happily settling into his new home in Launching Place with Adrian, Natalie and ten-year-old Poodle cross Sam. “He has plenty of energy and loves running around the backyard with Sam, at least until Sam’s had enough. He also likes just staring at the guinea pig cage,” said Adrian Rice. “He only has one bad habit and that’s biting toes, but he’s so cute we forgive him. He usually finds a way onto our bed at night, even though he and Sam have their own beds”. Adrian and Natalie are looking forward to giving Duke a loving home and fulfilled life. Their first challenge will be completing puppy pre-school. “We’re just happy we get to give him a good home. I can’t believe that he was thrown from a car. There are options if you can no longer look after a dog. Puppies are defenceless”. The Lost Dogs’ Home’s Shelter Manager Jodie McMillan condemns former owners of Duke saying that “the act of throwing an animal from a car or discarding a pet is cowardly and if owners were caught they would be prosecuted. Animal institutions provide a surrender service for people who cannot care for their pets, but what we ask is that people think very seriously about whether they should own a pet in the first place”. View our dogs and cats for adoption at The Lost Dogs’ Home.